You would be thinking that what is new about this TV. Now there are lots of smart TVs available in the market but what does this TV gives you. HOM is not just another TV it’s a home entertainment which comes with Android, 4K and full HD display with built-in Wi-Fi, HDMI, and USB ports and that’s at a price under Rs 30,000. Not just that HOM is made in India brand. HOM 55” 4K UHD Smart TV is a great packaged at price point under 30K. 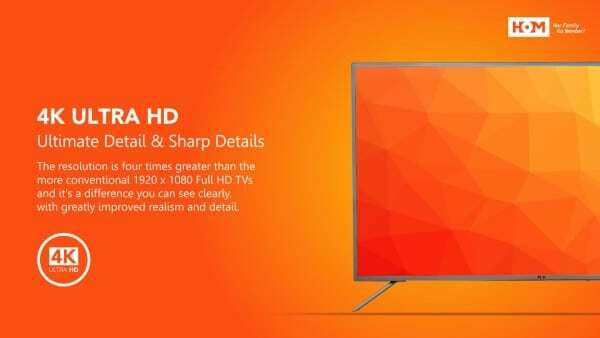 4K HD Display: HOM Is offering a 4K Ultra HD TV under rupees 30000 which is incredible. Mostly 4K TVs are expensive, but HOM has changed this scenario. 4K resolution is four-time greater compared to Full HD of 1920 x 1080 pixels. This outputs amazing picture quality brightness and contrast. Android: When we say Android one things come in mind apps. With HOM TV you can play apps like YouTube, play games and much more. HOM Android feature makes your TV and full entertainment machine. Full HD Display: HOM TV comes with full HD Display of 1920 x 1080 pixels. Watch your favorite TV shows in full HD with great quality. Ports: HOM TV comes with multiple ports to connect your TV to other entertainment devices. HOM TV comes with Built-in Wi-Fi, 3 HDMI ports, 2 USB ports, and 1 Video Input. Smart Remote: Handling multiple remote can be tedious. We have to handle remotes like a TV remote, Setup box remote, AC remote, Home entertainment (speakers) remote, etc. Now get rid of these multiple remotes, and HOM TV comes with Smart Remote which features Wi-Fi, Bluetooth and Infrared by these you can operate other electronic devices in your home with this single remote. Clear Music: A good quality display is useless without quality sound if your TV Not output great sound it will not give such great entertainment. HOM TV features clear sound with auto-noise removal technology which enhances your viewing experience. 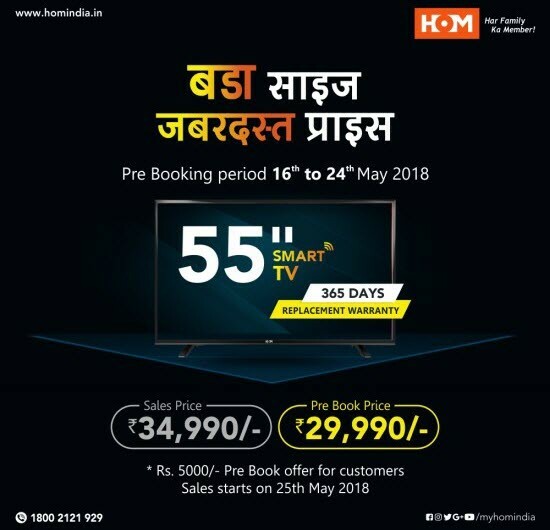 HOM TVs are available at regular channels as well as mobile phone stores across the country. HOM 55″ LED SMART TV comes with a one-year replacement warranty. HOM TV have some other products too their TV product line-up starts from 32” LED TV, 40” Smart LED TV and goes to 55” 4K LED TV.